Over the past decade, fiscal deficits emerged as one of the most pressing macroeconomic concerns around the world, both in developed and developing countries. Debt crises, most recently in the Eurozone, alerted the world to the dangers of running unsustainable government deficits. 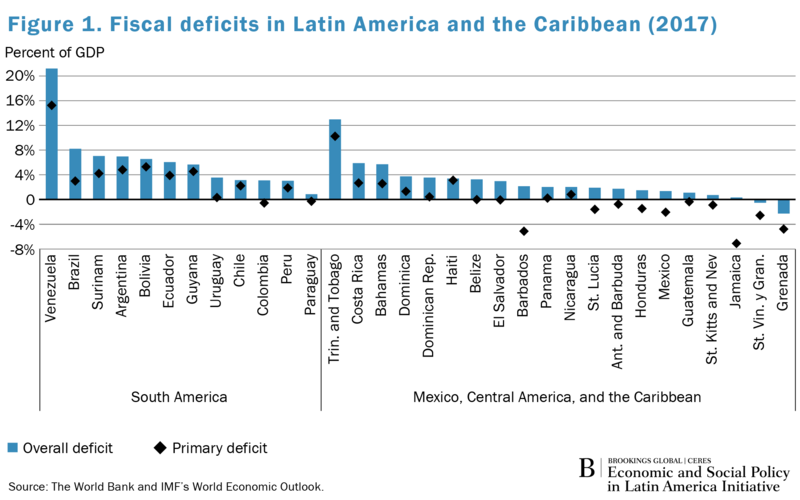 In fact, for the Latin America and Caribbean (LAC) region, 30 of 32 countries had fiscal deficits in 2017 (Figure 1). Given the prevalence of fiscal deficits in LAC (with a median observed fiscal deficit of 3 percent), natural questions arise: Are the deficits a threat and should most countries engage in fiscal adjustment? While a first instinctive reaction might tend to favor fiscal adjustments, the fact of the matter is that, under certain conditions, fiscal deficits (and sometimes even large fiscal deficits) might be practical or even desirable. The key aspects to consider when evaluating whether to carry out a fiscal adjustment or not are: (i) the duration of the underlying negative shock affecting economic activity and, consequently, fiscal revenues; (ii) how fiscal policy has been conducted over the business cycle, and; (iii) debt sustainability considerations. On the left panel of Figure 2, we can see that growth in the LAC region has been decelerating for the past six years, including negative growth in 2017. 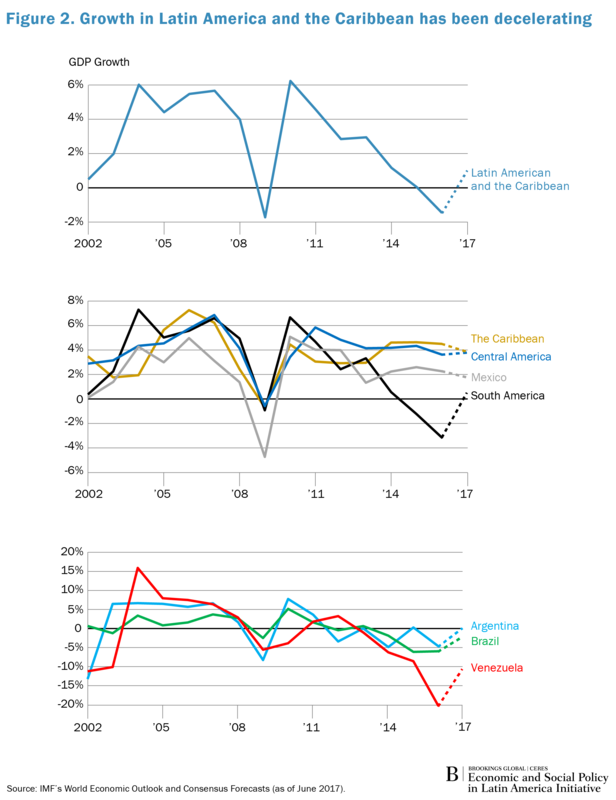 This rather lackluster performance was driven principally by the performance in South America (which accounts for 71.2 percent of the region’s GDP), given that Central America and the Caribbean have been growing at around 4 percent per year since 2010 (see right panels on Figure 2). If growth is decelerating, we should expect the fiscal deficit to increase. This natural association should not, in and of itself, cause major concerns, as the tax base is extremely sensitive to economic fluctuations. This implies that, during downturns, fiscal revenues will tend to plummet because of the large fall in the tax base, even if tax rates (which are the tax policy instruments under the control of the fiscal authority) remain unchanged. By the same token, in good times, the tax base increases due to naturally occurring factors internal to the country, endogenously and so do fiscal revenues. 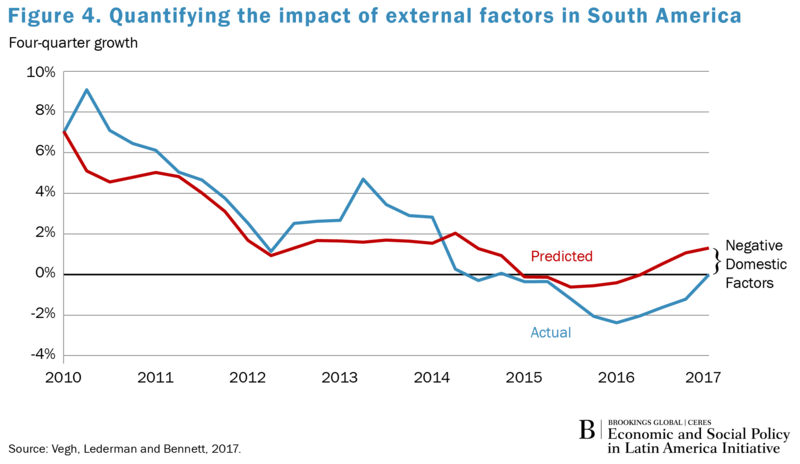 Given the relationship between observed fiscal deficits and economic growth, it is vital to understand the reasons for the region’s recent lackluster growth and how long this deceleration will last. While quite often growth deceleration is attributed to domestic policy and countries’ own growth factors, it is well known by now that fluctuations in developing countries’ output largely depend on external factors (by definition outside of their own control). Unfortunately, LAC countries are no exception. Figure 3 illustrates the behavior of: (i) commodity prices; (ii) China’s growth rate, which is particularly important for South America; (iii) G-7 growth, which is particularly relevant for Mexico and Central America, and; (iv) net capital inflows, which are meant to capture global liquidity. 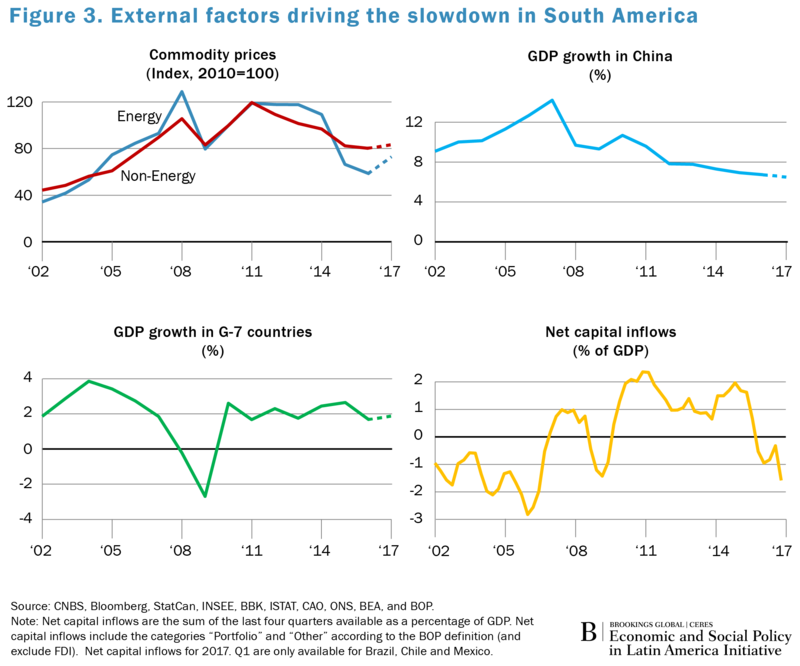 Figure 4 quantifies the overall role of external factors in South America’s growth. As can be seen in the figure, the growth that can be attributed to external factors tracks the actual growth profile quite well. In fact, about 60 percent of GDP fluctuations in South America are explained by the four aforementioned global factors. This indicates that, to a large extent—and despite considerable efforts to diversify the production and export structure, increase LAC countries’ productivity and competitiveness, and create larger domestic markets—developing countries exhibit an inherited volatility and dependence on external global factors. Naturally then, the pressure from global factors, in turn, increase the size of observed fiscal deficits in the region. In fact, the median fiscal deficit in LAC would decrease from 3 percent (when focusing on observed fiscal deficits) to about 2 percent if we focus on the so-called structural fiscal deficit (which excludes from the observed fiscal deficit the portion associated with business cycle fluctuations). Given that global factors influence actual fiscal deficits, a key question is whether the weakening effects of global factors are temporary or permanent. If temporary, then running fiscal deficits could reflect governments following counter-cyclical fiscal policies, exactly the type of policy recipe supported by basic macroeconomic textbooks. On the one hand, adherence to counter-cyclical fiscal policies would tend to speed up the recovery and avoid large and sensitive macroeconomic and social costs. On the other, if these weakening global factors were here to stay, then prudent fiscal policy would call for adjusting fiscal accounts to the new reality. After all, much like households, it is impossible to maintain chronic deficits on a permanent basis. Unfortunately, for most people (including policymakers and professional forecasters), it is simply impossible to know whether any given shock is temporary or permanent. Given this degree of uncertainty, a prudent fiscal policy prescription would recommend viewing positive shocks as more temporary (pushing countries to save more in good times) and negative shocks as more long-lasting (and hence to adjust more and thus avoid debt sustainability considerations). 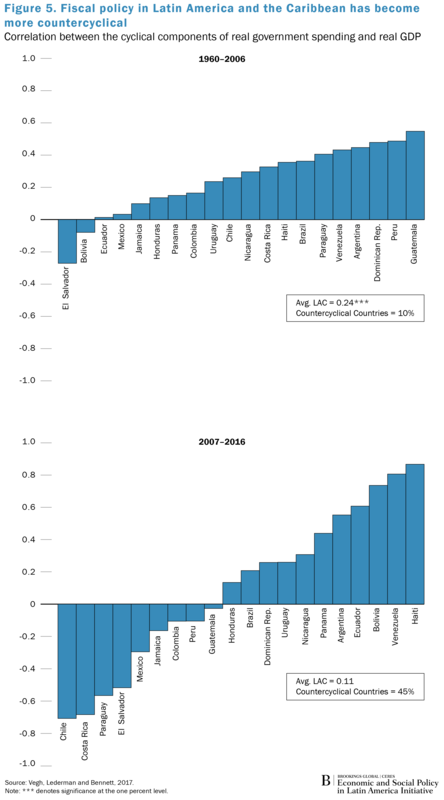 The good news is that, while to different degrees, about a half of LAC countries have saved more during the last commodity boom which, in turn, has allowed them to navigate adverse global conditions by conducting counter-cyclical fiscal policies over the past decade (see Figure 5). This was achieved by building macroeconomic buffers, including foreign reserves in central banks, reducing government debt, implementing fiscal rules, and instituting central bank independence. By and large, it seems that LAC countries have avoided major crises akin to those that plagued the region not so long ago. The bad news is that, despite all these improvements and in light of recurrent fiscal deficits, LAC countries clearly should have saved more during the boom. As a result, several countries will have to undergo fiscal adjustment to avoid serious debt sustainability problems. In other words, the main reason why it is so challenging to deal with debt sustainability problems in bad times is precisely due to insufficient savings during good times. Perhaps one day the region will learn for good this fundamental dictum. Note: This short piece relies heavily on Chapter 2 of the semiannual report from the World Bank’s Office of the Chief Economist for LAC, co-authored by Carlos Vegh, Daniel Lederman, and Federico Bennett, titled “Leaning against the wind: Fiscal policy in Latin America and the Caribbean in a historical perspective,” April 2017, available here. The reader is referred to the report for references and further details. We are grateful to Luis Morano for his help with this piece.